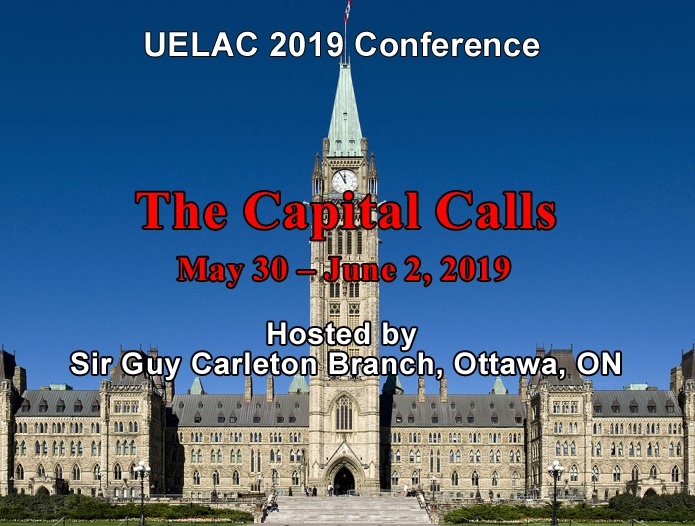 The United Empire Loyalists' Association of Canada is an organization dedicated to enriching the lives of Canadians through knowledge of the past, in particular the history of the United Empire Loyalists and their contribution to the development of Canada. In addition to perhaps one Canadian in ten having a Loyalist ancestor, many others of Loyalist descent live elsewhere – in the United States, in commonwealth countries such as Australia and New Zealand, and scattered around the world. The subjects in the menu to the left reflect the activities of many members of the Association, the branches, and the Association itself. Activities of the UELAC are guided by six key directives stated in its Mission Statement. Hello from the UELAC Conference! Greetings from Moose Jaw, Saskatchewan! 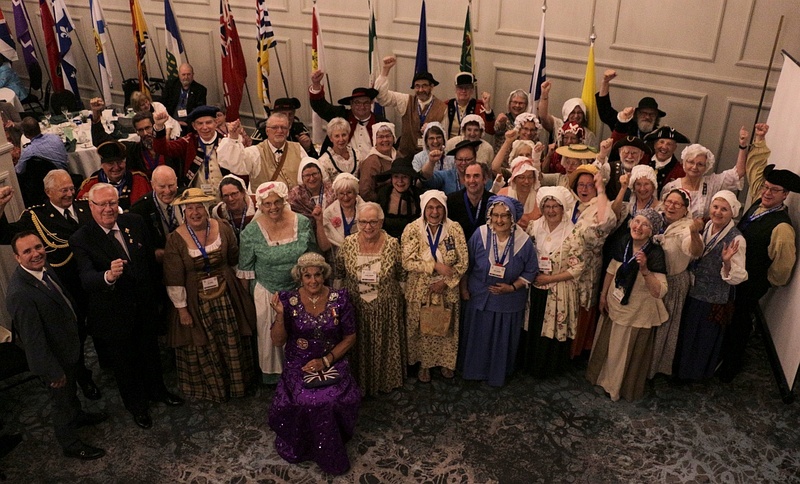 Those in period clothing at the banquet included Mayor Fraser Tolmie (front row, left) and Lieutenant-Governor Thomas Molloy (front row, second from left). Our guest speaker, “The Queen” (seated), made a very humourous presentation. In 1784, with the arrival of a second wave of Loyalists, Shelburne was briefly the fourth largest city in North America – after New York, Philadelphia, and Charleston. Apr. 22: The latest issue of Loyalist Trails, 2019-#16, is now available. Click here for the online newsletter index. Apr. 18: The latest issue of Loyalist Trails, 2019-#15, is now available. Click here for the online newsletter index. Apr. 8: The latest issue of Loyalist Trails, 2019-#14, is now available. Click here for the online newsletter index. Apr. 2: The latest issue of Loyalist Trails, 2019-#13, is now available. Click here for the online newsletter index. Mar. 27: The latest issue of Loyalist Trails, 2019-#12, is now available. Click here for the online newsletter index. Mar. 20: The latest issue of Loyalist Trails, 2019-#11, is now available. Click here for the online newsletter index. Mar. 12: The online Loyalist Trails newsletter has been updated to the latest issue, 2019-10. Mar. 11: The online Loyalist Trails newsletter has been updated with a new issue, 2019-08. Feb. 22: Issues 2019-#06 and 2019-#07 of Loyalist Trails are now available online. Click here for the newsletter index. Feb. 17: Information about Alexander McDonald has been added to the Loyalist Directory. Thanks to Fran Rose for contributing information. Feb. 4: The latest issue of Loyalist Trails, 2019-#05, is now available. Click here for the online newsletter index. Feb. 1: Information about Daniel Lightheart has been added to the Loyalist Directory. Thanks to Lynn McAlister for contributing information. Jan. 29: The latest issue of Loyalist Trails, 2019-#04, is now available. Click here for the online newsletter index. Jan. 22: The latest issue of Loyalist Trails, 2019-#03, is now available. Click here for the online newsletter index. Jan. 15: Issues 2019-#01 and 2019-#02 of Loyalist Trails are now available online. Click here for the newsletter index. Jan. 4: Issues 2018-#49, 2018-#50, 2018-#51, and 2018-#52 of Loyalist Trails are now available online. Click here for the newsletter index. Jan. 1: Happy New Year from the UELAC! Dec. 3: The list of UE Certificates and Loyalist Directory have been updated according to the certificates issued in October, 2018. Dec. 3: The latest issue of Loyalist Trails, 2018-#48, is now available. Click here for the online newsletter index. Nov. 26: The latest issue of Loyalist Trails, 2018-#47, is now available. Click here for the online newsletter index. Nov. 26: Newly posted: the 2018 winners of the Philip E. M. Leith Memorial Award. Nov. 26: Information about Adam Huber (Hubbert) and Ethel Davis (Davison) has been added to the Loyalist Directory. Thanks to Barbara Musgrave for contributing information. Nov. 19: The latest issue of Loyalist Trails, 2018-#46, is now available. Click here for the online newsletter index. Nov. 13: Issues 2018-#44 and 2018-#45 of Loyalist Trails are now available online. Click here for the newsletter index. Oct. 29: The latest issue of Loyalist Trails, 2018-#43, is now available. Click here for the online newsletter index. Oct. 23: The latest issue of Loyalist Trails, 2018-#42, is now available. Click here for the online newsletter index. Oct. 18: The latest issue of Loyalist Trails, 2018-#41, is now available. Click here for the online newsletter index. Oct. 17: The list of UE Certificates and Loyalist Directory have been updated according to the certificates issued in September, 2018. Oct. 9: The latest issue of Loyalist Trails, 2018-#40, is now available. Click here for the online newsletter index. Oct. 4: The latest issue of Loyalist Trails, 2018-#39, is now available. Click here for the online newsletter index. Sept. 27: The list of UE Certificates and Loyalist Directory have been updated according to the certificates issued in August, 2018. Sept. 24: The latest issue of Loyalist Trails, 2018-#38, is now available. Click here for the online newsletter index. Sept. 20: The latest issue of Loyalist Trails, 2018-#37, is now available. Click here for the online newsletter index. Sept. 16: The Fall 2017 issue of the Loyalist Gazette is now publicly available, according to UELAC policy. It is available in digital format. Sept. 10: The latest issue of Loyalist Trails, 2018-#36, is now available. Click here for the online newsletter index. Sept. 4: The latest issue of Loyalist Trails, 2018-#35, is now available. Click here for the online newsletter index. Aug. 27: The latest issue of Loyalist Trails, 2018-#34, is now available. Click here for the online newsletter index. Aug. 20: The latest issue of Loyalist Trails, 2018-#33, is now available. Click here for the online newsletter index. Aug. 14: The latest issue of Loyalist Trails, 2018-#32, is now available. Click here for the online newsletter index. Aug. 13: The list of UE Certificates and Loyalist Directory have been updated according to the certificates issued in July, 2018. Aug. 8: The latest issue of Loyalist Trails, 2018-#31, is now available. Click here for the online newsletter index. Aug. 3: David Kanowakeron Hill Morrison, UE has been named the recipient of the 2018 UELAC Dorchester Award. July 30: The latest issue of Loyalist Trails, 2018-#30, is now available. Click here for the online newsletter index. July 24: The latest issue of Loyalist Trails, 2018-#29, is now available. Click here for the online newsletter index. July 16: The latest issue of Loyalist Trails, 2018-#28, is now available. Click here for the online newsletter index. July 9: The latest issue of Loyalist Trails, 2018-#27, is now available. Click here for the online newsletter index. July 5: The list of UE Certificates and Loyalist Directory have been updated according to the certificates issued in June, 2018. July 3: The latest issue of Loyalist Trails, 2018-#26, is now available. Click here for the online newsletter index. June 30: Information about Frederick Rupert (Ruppert, Rubert) has been added to the Loyalist Directory. Thanks to Kristina Harrison for submitting information. June 26: The latest issue of Loyalist Trails, 2018-#25, is now available. Click here for the online newsletter index. June 25: Many thanks to Ben Thornton, UE, who developed the Ontario Licence Plate project, and also to Fred Hayward, UE, who shepherded it to a successful conclusion. The last of the plates ordered by UELAC were shipped in June 2018. Loyalist plates remain available from Service Ontario. June 21: The list of UE Certificates and Loyalist Directory have been updated according to the certificates issued in May, 2018. June 18: The latest issue of Loyalist Trails, 2018-#24, is now available. Click here for the online newsletter index. June 18: Monuments update: A new photo, expanded text and a short video have been added to the Regina Cairn page. June 11: The latest issue of Loyalist Trails, 2018-#23, is now available. Click here for the online newsletter index. June 4: The latest issue of Loyalist Trails, 2018-#22, is now available. Click here for the online newsletter index. May 28: The latest issue of Loyalist Trails, 2018-#21, is now available. Click here for the online newsletter index. May 23: The list of UE Certificates and Loyalist Directory have been updated according to the certificates issued in March & April, 2018. May 23: The latest issue of Loyalist Trails, 2018-#20, is now available. Click here for the online newsletter index. May 18: The list of UE Certificates and Loyalist Directory have been updated according to the certificates issued in January & February, 2018. May 15: The latest issue of Loyalist Trails, 2018-#19, is now available. Click here for the online newsletter index. May 7: The latest issue of Loyalist Trails, 2018-#18, is now available. Click here for the online newsletter index. Apr. 30: The latest issue of Loyalist Trails, 2018-#17, is now available. Click here for the online newsletter index. Apr. 24: The latest issue of Loyalist Trails, 2018-#16, is now available. Click here for the online newsletter index. Apr. 16: Issues 2018-#14 and 2018-#15 of Loyalist Trails are now available online. Click here for the newsletter index. Apr. 3: The latest issue of Loyalist Trails, 2018-#13, is now available. Click here for the online newsletter index. Mar. 31: Information about Hezekiah, John and John Jr. Lyon has been added to the Loyalist Directory. Thanks to Stephen McDonald for submitting information. Mar. 26: The latest issue of Loyalist Trails, 2018-#12, is now available. Click here for the online newsletter index. Mar. 21: Information about Jacob Glover has been added to the Loyalist Directory. Thanks to Deborah Glover for submitting information. Mar. 19: The latest issue of Loyalist Trails, 2018-#11, is now available. Click here for the online newsletter index. Mar. 19: Information about John George Graves has been added to the Loyalist Directory. Thanks to Brian Schellenberg for submitting information. Mar. 16: Information about Adam Graves has been added to the Loyalist Directory. Thanks to Brian Schellenberg for submitting information. Mar. 12: The latest issue of Loyalist Trails, 2018-#10, is now available. Click here for the online newsletter index. Mar. 6: The latest issue of Loyalist Trails, 2018-#09, is now available. Click here for the online newsletter index. Mar. 1: The latest issue of Loyalist Trails, 2018-#08, is now available. Click here for the online newsletter index. Feb. 21: The latest issue of Loyalist Trails, 2018-#07, is now available. Click here for the online newsletter index. Feb. 20: The list of UE Certificates and Loyalist Directory have been updated according to the certificates issued in December, 2017. Feb. 15: Information about Joseph Corwin and Thomas Silverthorn, Sr. has been added to the Loyalist Directory. Thanks to Brooke Skelton for submitting information. Feb. 14: The latest issue of Loyalist Trails, 2018-#06, is now available. Click here for the online newsletter index. Feb. 13: Information about John Chisholm (Chesholm) has been added to the Loyalist Directory. Thanks to Brooke Skelton for submitting information. Feb. 10: Updates for the 2018 UELAC Conference. Feb. 10: Information about Jacob Van Allen and John Young Sgt has been added to the Loyalist Directory. Thanks to Cynthia Young and Jo Ann Tuskin for submitting information. Feb. 5: The latest issue of Loyalist Trails, 2018-#05, is now available. Click here for the online newsletter index. Feb. 4: Information about David Palmer Sr. has been added to the Loyalist Directory. Thanks to Jo Ann Tuskin for submitting information. Jan. 29: The latest issue of Loyalist Trails, 2018-#04, is now available. Click here for the online newsletter index. Jan. 27: Information about Abraham Overholt Sr. and Hugh Pudsey has been added to the Loyalist Directory. Thanks to Jo Ann Tuskin and Carol Harding for submitting information. Jan. 24: The latest issue of Loyalist Trails, 2018-#03, is now available. Click here for the online newsletter index. Jan. 20: Information about Christopher (Christian) Hanes (Haines?) has been added to the Loyalist Directory. Thanks to Jo Ann Tuskin for submitting information. Jan. 19: The latest issue of Loyalist Trails, 2018-#02, is now available. Click here for the online newsletter index. Jan. 14: Information about Robert Dove has been added to the Loyalist Directory. Thanks to Carol Harding for submitting information. Jan. 9: The latest issue of Loyalist Trails, 2018-#01, is now available. Click here for the online newsletter index. Jan. 6: Information about Frederick Fox has been added to the Loyalist Directory. Thanks to Jo Ann Tuskin for submitting information. Jan. 3: Loyalist Trails issues 2017-#51, 2017-#52 and 2017-#53 are now available online. Click here for the online newsletter index. Jan. 2: The list of UE Certificates and Loyalist Directory have been updated according to the certificates issued in November, 2017. Jan. 1, 2018: UELAC wishes you a happy new year!